Abstract: Using data obtained from the Canadian Community Health Survey, this article estimates a simple Mincer Model to examine the impact of higher education on income in Canada. Furthermore, this study also extends the Mincer Model by including other determinants of earning such as gender, health, marital status, and immigration status. The outcome of the study reveals that graduates of Post-Secondary Education earn significantly more, on average, than graduates of only High School regardless of gender or immigrant status. In recent times, a debate ensues whether it is financially worth pursuing higher education. Canadian students are facing increasing tuition fees and are being laden with a huge education related debt burden (Macdonald and Shaker, 2012). Given this situation, it is an obvious issue for the Canadian students whether or not they should pursue higher education. An important element of this debate is the financial return to Post-Secondary education. The real question being, how much more does a Canadian student with Post-Secondary Education earn compared to a high school graduate and what happens to their earnings premium over time: Is it increasing or is it decreasing? The purpose of this study is to examine these issues. The results of this study could also have significant policy implications, athough it should be noted that this is not a causal analysis, therefore caution should be taken. Education is important, not only for economic growth, but also for a country’s overall well-being. Joy Murray (2009) found that individuals with higher levels of education have been shown to benefit from both improved levels of health as well as increased longevity. There is also strong evidence that supports a positive correlation between a parent’s level of education and their children’s level of health. Other societal benefits of higher education include less use of foster care and juvenile diversion, lower crime, and lower dependence on welfare transfers as documented by W.C. Riddell (2006). However, students should be provided with enough incentives to continue pursuing higher education. If the results of this study show a high earnings premium of Post-Secondary education, then students will be more encouraged to pursue higher education. At the same time, policy makers may consider determining ways on how to make higher education more accessible, so that all citizens might have the opportunity to receive the benefits from continuing their education. On the other hand, if the study finds a decreasing earnings premium, then policy makers may consider looking for ways to decrease the costs of education. The purpose of this paper is to estimate the education earnings premium in Canada for 2007/2008 and compare this result with the earnings premium for 2011/2012 to determine whether it has changed between these two periods. It will also examine whether these earnings premiums differ between male and female as well as estimate the earnings premium for both the Canadian born and immigrant populations. This study will have the following structure: review of relevant literature; in the next section indicates the data and methodology used; the next section presents the results of the study; and finally the conclusions show the results of the study. Over the last couple of years, several extensive studies from around the world have been elaborated regarding the premium associated with higher education: Boudarbat, Brahim; Lemieux, Thomas; Riddell, W. Craig (2010) for Canada; J.B. Burbidge, L. Magee, A.L. Robb (2001) for United States of America and Canada; Ian Walker and Yu Zhu (2005) for the United Kingdom; and Nigel C. O’Leary and Peter J. Sloane (2011) for the United Kingdom. This paper will provide more recent results compared to other studies in Canada. It will also use a different data source (CCHS), of which the results can be used to check the sturdiness of the findings from existing Canadian research. Using The Canadian Census of Population data Boudarbat et al. (2010) examined the evolution of the returns to human capital in Canada for the period of 1980-2005. The study found that for men the economic returns to education (measured by the skill premium relative to high school graduates) increased between 1980 and 2005, while the adjusted differential rose by 8% for non-university Post-Secondary Graduates and 6% for those with a university post-graduate or professional degree. However for women the returns to education beyond high school were less, even though the adjusted wage differentials also increased by 3% for the non-university Post-Secondary Graduates and university postgraduate categories and 6% for university bachelor’s degree graduates. The returns to experience were also shown to be lower for women than for men. Burbidge et al. (2001) used multiple large scale surveys such as the U.S. March Current Population Survey (1981-1999), Statistics Canada’s Survey of Consumer Finances (1981-1997), Statistics Canada’s Survey of Labour Income Dynamics (1994-1999), and Statistics Canada’s Labour Force Survey (1997) in order to analyze the education premiums observed in Canada and the United states, as well as to extend the Canadian data set for the education premium beyond 1997. The study argued that although the economies of Canada and the United States are similar, the changes to the education premiums earned in both countries are very distinctive. The results from the research support this claim as the education premium in the United States has seen significant growth from 1981-1999, while Canada’s education premium has remained quite constant and possibly even declined slightly from 1981-1997. Using data collected from the UK Labour Force Survey between 1996 and 2003, Walker and Zhu (2005) attempted to analyze changes to the “college premium” over time, subject fields, wage differences, and cohorts. They also looked to address common concerns of over-education and the effects of the rapidly increasing university participation rate in the UK on the monetary return of acquiring a degree. This study found that although there was a rising number of graduates entering the labor market, the average college premium remained relatively stable over the given time period. The two exceptions to this being seen by those acquiring a degree in math or engineering who had experienced a rising return and by recent graduates (both male and female), who had begun to see a decrease in returns for a degree. Walker and Zhu (2005) explained the latter by using evidence which suggests that new graduates are close substitutes for recent graduates (but not older graduates) and therefore will experience a fall in the return to their degree when university participation rises. O’Leary and Sloane (2011) used data collected from the UK Labor Force Survey between 1997 and 2006 to build upon previous research regarding the premium earned on a university education and how it has varied over time and subject of degree. The study found that although university participation in the UK had seen a rapid expansion in the number of participants, the value placed on their degrees within the labor markets had not seemed to diminish, regardless of gender or subject degree. Math and computing had been the largest gainers in value with increases of 6.8% and 8.7% respectively. The only noted change found over the study’s time period was the moderate decline in the financial rewards seen by recent graduates. The literature review suggests that there is no conclusive results on the education earnings premium in Canada as well as in the USA and the UK. Therefore it is important to conduct further study to find conclusive results on this issue and build upon previous research by using more comprehensive and up-to-date data, as well as providing a further general understanding on the “college premiums”. This study will use data from the Canadian Community Health Survey (2007/2008 and 2011/2012). The Canadian Community Health Survey (CCHS) is a cross-sectional survey which collects information related to health status, income, employment and other socio-demographic characteristics for the Canadian population. Approximately 130,000 respondents were interviewed for the CCHS-2007/2008. The sample size for the CCHS 2011/2012 was 65,000. This study will estimate all models for the following sub categories: CCHS 2007/2008 and CCHS 2011/2012; Male and Female; Age 25-54, age 55-64; Canadian born population and Immigrant population. Table 1 presents the Descriptive Statistics, in which we have analyzed the overall classification of our sample group for the two periods of time, 2007/2008 and 2011/2012. For the main variable, education, there were four categories: Less Than Secondary Education, Secondary Graduate Education (High School), Some Post-Secondary Education and Post-Secondary Education (College/University). Within the sample group, 7% of respondents fell into the Less Than Secondary Education category in CCHS07/08, and 6% in CCHS11/12. For Secondary Graduate Education, 11% of all respondents belonged to this category for both CCHS07/08 and CCHS11/12. Those with Some Post-Secondary Education accounted for only 5% of the total sample group in CCHS07/08 and 3% in CCHS11/12. While the last category, Post-Secondary Education, contained 72% of all respondents in CCHS07/08 and 74% in CCHS11/12. In the sample of CCHS07/08 there were 54% female respondents and 46% male respondents. While for the sample of CCHS11/12 there was little difference, around 1%, with 55% female respondents and a 45% male respondents. For the final category in the sample of CCHS07/08 there were 86% Canadian born and 14% Immigrants respondents while for the sample of CCHS11/12 there were 85% Canadian born and 15% Immigrants respondents. 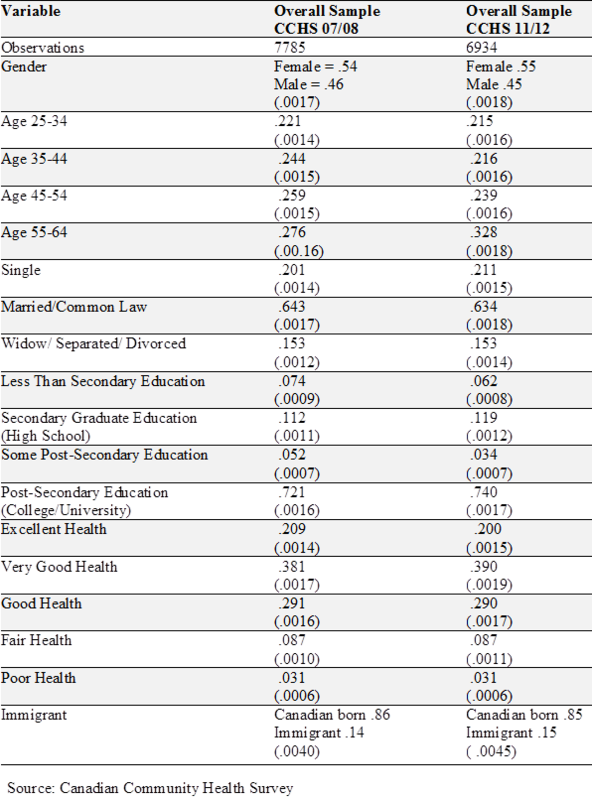 The main analysis is provided by Table 2, which shows the Regression Results; determinants of Income in comparison with the education levels, for the time period of 2007/2008. 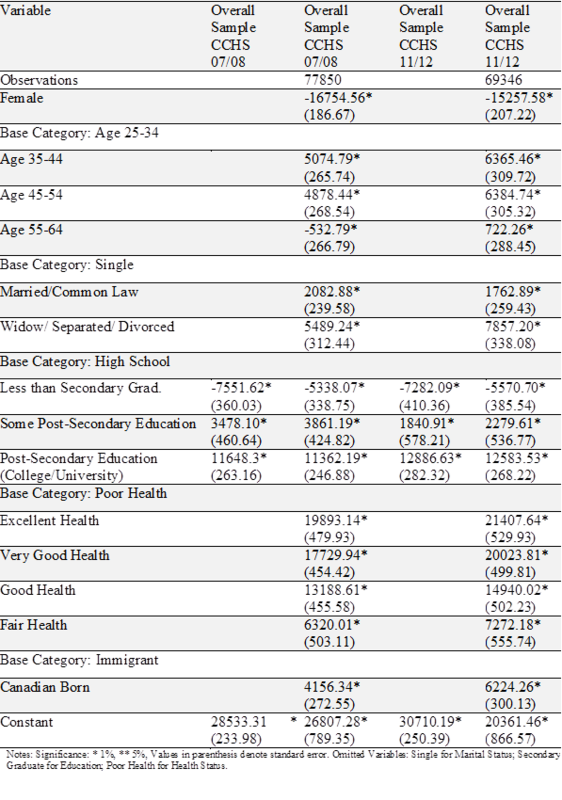 The second column shows the results of the model that only includes education variables, a person with Less Than Secondary Education earns $7,551.62 (s.e.m. = $360.03) less compared to a Secondary Graduate. When compared to a Secondary Graduate, a person with Some Post-Secondary Education earns $3,478.10 (s.e.m. = $460.64) more while a person with Post-Secondary Education earns $11,648.30 (s.e.m. = $263.16) more yearly. 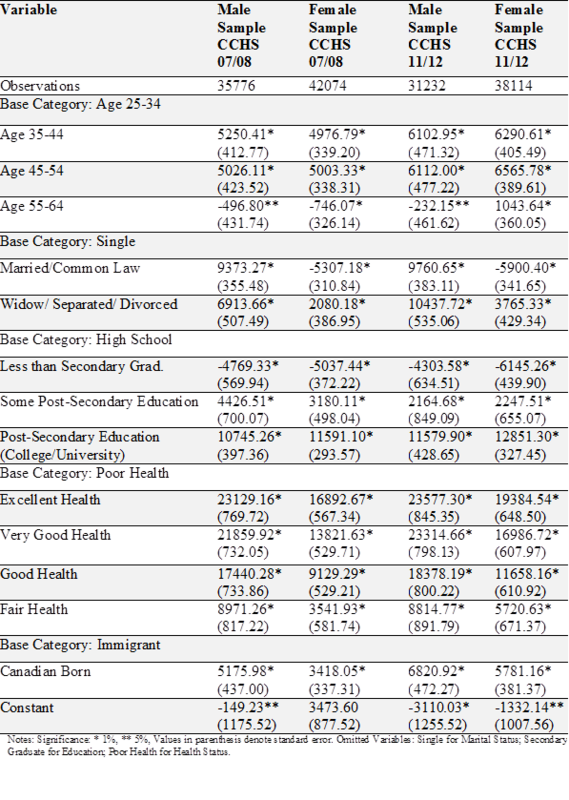 Meanwhile, in the same time period of 2007/2008 the third column provides the results of the model that also includes socio-demographic variables besides education variables, an individual with Less Than Secondary Education earns $5,338.07 (s.e.m. = $338.75) less compared to a Secondary Graduate. When compared to a Secondary Graduate, an individual with Some Post-Secondary Education earns $3,861.19 (s.e.m. = $424.82) more. While an individual with Post-Secondary Education earns $11,362.19 (s.e.m. = $246.88) more yearly. In the time period of 2011/2012 the fourth column shows the results of the model that only includes education variables, a person with Less Than Secondary Education earns $7,282.09 (s.e.m. = $410.36) less compared to a Secondary Graduate. On the other hand, compared to a Secondary Graduate, a person with Some Post-Secondary Education earns $1,840.91 more. While a person with Post-Secondary Education earns $12,886.63 (s.e.m. = $282.32) more. Nonetheless, we could observe some changes with the time period of 2011/2012 the fifth column provides the results of the model that also includes socio-demographic variables besides education variables, an individual with Less Than Secondary Education earns $5,570.70 (s.e.m. = $385.54) less compared to a Secondary Graduate. On the other hand, compared to a Secondary Graduate, an individual with Some Post-Secondary Education earns $2,279.61 (s.e.m. = $536.77) more. Meanwhile an individual with Post-Secondary Education earns $12,583.53 (s.e.m. = $268.22) more. Considering the gap from 2007/2008 to 2011/2012, the results suggest that there was a slight increase in earnings for individuals that had Post-Secondary Education, while they also imply that there was a significant decrease in earnings for individuals with Some Post-Secondary Education. In both 2007/2008 and 2011/2012 data, Gender appears to play a powerful role on earnings, with males earning significantly more than females, although it can be inferred that this gap has somewhat decreased over the two time periods. Being Canadian born also appears to have a powerful impact on annual income, with those born domestically earning substantially more than individuals with immigrant status. The results also suggest that this difference has also increased over the two time periods. Health has shown a strong impact on earnings. Individuals with excellent, very good, good, or fair health earns significantly more than an individual with poor health. Age has a somewhat distributed effect on income. Individuals will initially see a substantial rise in earnings around the age of 35 followed by a steady decline continuing until retirement. This may be true for both time periods. We can observe that individuals who are married, separated, divorced, or widowed all see considerable increases to income compared to those who are single. Table 3 shows the Regression Results: Determinants of Income which include the variances for Male and Female in the different categories. For the time period of 2007/2008, a Male with Less Than Secondary Education earns $4,769.33 (s.e.m. = $569.94) less compared to a Secondary Graduate. On the other hand, compared to a Secondary Graduate, a Male with Some Post-Secondary Education earns $4,426.51 (s.e.m. = $700.07) more, while a Male with Post-Secondary Education earns $10,745.26 (s.e.m. = $397.36) more. A Female with Less Than Secondary Education earns $5,037.44 (s.e.m. = $372.22) less compared to a Female that is a Secondary Graduate. On the other hand, compared to a Female that is a Secondary Graduate, a Female with Some Post-Secondary Education earns $3,180.11 (s.e.m. = $498.04) more, and a Female with Post-Secondary Education earns $11,591.10 (s.e.m. = $293.57) more annually. However, for the time period of 2011/2012, a Male with Less Than Secondary Education earns $4,303.58 (s.e.m. = $634.51) less compared to a Secondary Graduate. Compared to a Secondary Graduate, a Male with Some Post-Secondary Education earns $2,164.68 (s.e.m. = $849.09) more while a Male with Post-Secondary Education earns $11,579.90 (s.e.m. = $428.65) more. A Female with Less Than Secondary Education earns $6,145.26 (s.e.m. = $439.90) less compared to a Female Secondary Graduate. Compared to a Female Secondary Graduate, a Female with Some Post-Secondary Education earns $2,247.51 (s.e.m. = $655.07) more while a Female with Post-Secondary Education earns $12,851.30 (s.e.m. = $327.45) more. 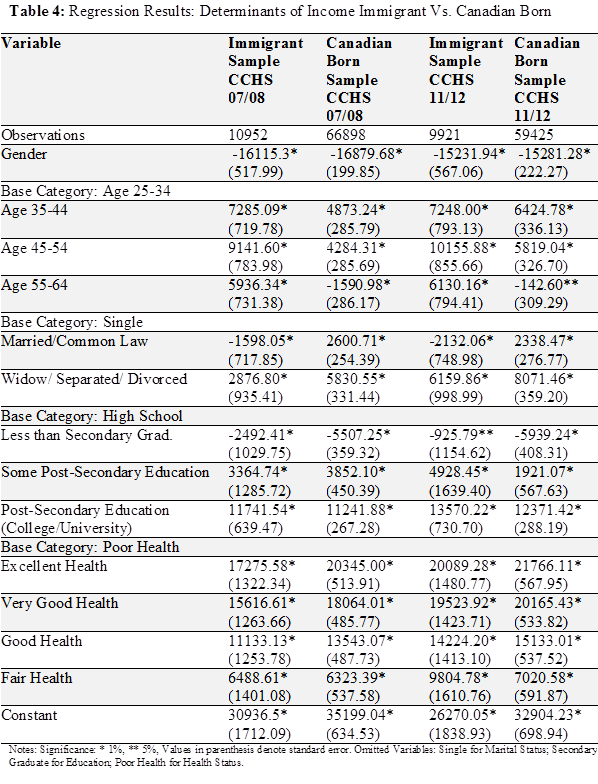 Other important results from Table 3 are as follows: It is indicated that Canadian born citizens of both genders see an increase to income of around $1,000 over the noted period of time; regarding age, both Males and Females experience changes in income qualitatively similar to the results of the models shown in Table 2; Males experience large returns to earnings when they fall into both the married and widowed/separated/divorced categories while Females face negative returns to earnings when married and only minor returns when widowed, separated, or divorced. The second subgroup of the study can be detailed in Table 4, which presents the Regression Results of the determinants of income for immigrant and Canadian born citizens. In the time period of 2007/2008, an Immigrant with Less Than Secondary Education earns $2,492.41 (s.e.m. = $1,029.75) less compared to the base category. If compared to the base category, an Immigrant with Some Post-Secondary Education earns $3,364.74 (s.e.m. = $1,285.72) more, while an Immigrant with a Post-Secondary Education earns $11,741.54 (s.e.m. = $639.47) more. A Canadian born citizen with Less Than Secondary Education earns $5,507.25 (s.e.m. = $359.32) less compared to the base category. On the other hand, compared to the base category, a Canadian born citizen with Some Post-Secondary Education earns $3,852.10 (s.e.m. = $450.39) more, while a Canadian born citizen with a Post-Secondary Education earns $11,241.88 (s.e.m. = $267.28) more. In the time period of 2011/2012 an Immigrant with Less Than Secondary Education earns $925.79 (s.e.m. = $1,154.62) less compared to the base category while an Immigrant with Some Post-Secondary Education earned $4,928.45 (s.e.m. = $1,639.40) more. An Immigrant with a Post-Secondary Education is shown to earn $13,570.22 (s.e.m. = $730.70) more, but a Canadian born citizen with Less Than Secondary Education earns $5,939.24 (s.e.m. = $408.31) less compared to the base category. On the other hand, compared to the base category, a Canadian born citizen with Some Post-Secondary Education earns $1,921.07 (s.e.m. = $567.63) more while a Canadian born citizen with a Post-Secondary Education earns $12,371.42 (s.e.m. = $288.19) more. Other important results of Table 4 are as follows: Females, Immigrants and Canadian born, in both samples for 2007/2008 and 2011/2012 earn significantly less them males; The results of the study suggest that within the age groups for both Immigrants and Canadian born citizens over the time period experienced increases in the returns to their earnings; For an Immigrant who is married or common law, the results suggest that this has a negative impact on earnings which increases over time, while for a married Canadian born citizen it is implied that this has a positive relationship that decreases over time; Both Immigrants and Canadian individuals who are separated, divorced, or widowed may all see significantly increases in income compared to those who are single. Using data obtained from the Canadian Community Health Survey, this article estimates a simple Mincer Model to examine the impact of higher education on income in Canada. Further, this study also extended the Mincer Model by including other determinants of earning such as gender, health, marital status, and immigration status. The model determines these estimates by using the Ordinary Least Square Method (OLS), and within this estimation, Statistical Package for the Social Science (SPSS) and Stata is used. The outcome of the study reveals a significant positive relationship for any education level over High School, with College/University education providing the highest premium over High School level education, regardless of gender or immigrant status. An opposite negative correlation was also observed with any education level below High School. The results of the study suggest that within the two periods of 2007/2008 and 2011/2012, earning premiums from College/University education did increased over time. However, other interesting highlights should also be taken into account: Women appear to be more affected by changes in their level of education than men, making it more important financially for them to acquire a degree. In addition to this, immigrants appear to be more influenced by high levels of education than Canadian born, which should lead Non-Canadian born citizens to have a higher priority when obtaining a university degree. There may be certain policy implications that could be taken from this study, since the results show a high earnings premium of Post-Secondary Education over time. Societal benefits from higher levels of education such as improved health, reduced crime and improved civic engagement, should also be considered. In order to reduce income inequality, policy makers may consider working towards making higher education more accessible, such as funding Post-Secondary Education, supporting cheap credits for students, etc., for all citizens to have an equal opportunity to receive the benefits of a higher education. As stated earlier, this is not a causal analysis so discretion should be taken. A shortcoming of this study comes from data limitations, particularly concerning Native Canadians. If clear division in data does become available, further studies should not only include the information of Native Canadians, but also immigrants, dividing them by different nationalities and their time living in Canada. These intervals were chosen in order to observe any noticeable fluctuations from before and after the financial crisis of 2008.